If you don’t own an iPad 2 and you’re about to skim past this post, let me interrupt you for a second. You can play most of Rebuild [$2.99] right now for free, as the Flash game Rebuild 2. And you really should. While the iPad 2 version comes with a few extra bells and whistles and plays gorgeously on a touch screen, this is a game that everyone should play whether they have the newest, shiniest gadget or not. Just be prepared to lose a few hours of your life to it when you do. I don’t wave around non-words like “unputdownable" often, but Rebuild deserves it. Though it’s not an especially deep strategy game, it has the perfect mix of exploration, danger and difficulty to hook anyone for at least an hour or two, and maybe much longer. And yes, yes, we’re up to our necks in zombie games, but this is a zombie/strategy/city builder and that’s not something you see every day. 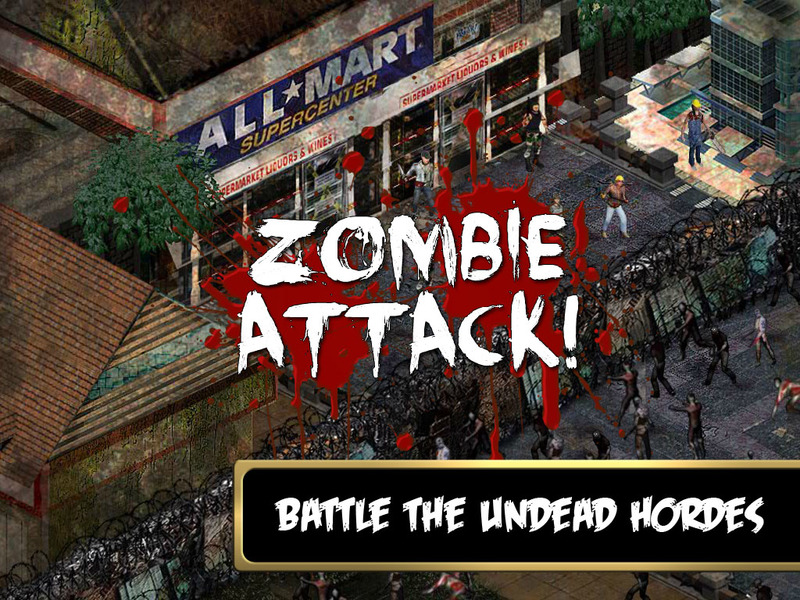 So here’s the premise: you are the leader of a tiny outpost of survivors in the midst of a city overrun by zombies. Your few city blocks aren’t enough to sustain your people for long, so you need to branch out. But danger lurks all around. Throughout the game you can explore the blocks around you, rescue survivors, scavenge for food and supplies, and reclaim land – all while defending against waves and hordes of zombies. But first you need to establish your scenario. You can build a character, male or female, with an odd but broad selection of faces, hair styles and accessories. You can name your town and pick a piece of starting equipment. And then you can define the difficulty. Your town can range from small to huge, which establishes the length of the game. The difficulty ranges from very easy to impossible, and those are pretty accurate descriptions. So you set out with your merry band on your few small squares of land. Each turn you can send your fellows out on missions. You might scout a nearby block. 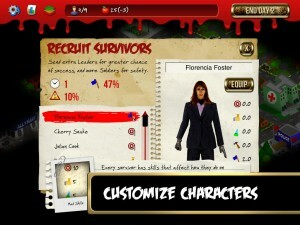 Following that, you might send a few guys to clear out the zombies so you can claim it as part of your town. Rebuild is a numbers game — stack enough of one stat against an appropriate challenge and you will be guaranteed to overcome it. The game will even inform you of your odds. But there are several stats to balance, and things become more complex as your city grows. And while it might seem like a good idea to keep everyone busy, you never know when Zed will attack. 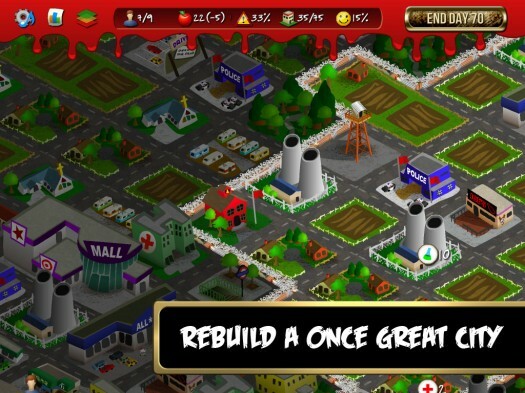 If your city is undefended, an attack might leave you with fewer survivors and more dead. As you progress through the game you have to strike a balance between recruiting enough survivors to keep progressing, having enough housing to keep them, and finding or growing enough food to stave off starvation. Random events happen at the end of most turns, and they might make things easier or more difficult. As leader, you’ll often be called on to make difficult choices. These choices often tie in to the multiple available endings, and they’re often intriguing. Do you act in self-interest or work for the good of the group? Do you let religion take hold, or attempt to stamp it out? And ultimately, once you’ve found a way to survive do you take it or do you keep going, trying to find something better? These decisions feed into your final score. You’re ranked on how long it took you win (or lose), how much you did with your time in zombie land, how difficult your game was and how many endings you found in one go. It’s a great way to inspire players to keep trying for all the endings, keep playing, keep exploring. Be warned, however, that there’s no way to track your success. There are no leaderboards, local or otherwise, so you won’t have the chance to compare your progress through different runs. It’s a serious oversight, but one of very few. Otherwise, Rebuild is a treat. It comes with charming art, although its character portraits border on the surreal. The soundtrack is creepy and ambient, a perfect accompaniment to the bleak world the game inhabits. It’s good enough that it makes me forget how tired I am of zombies. Rebuild probably won’t satisfy fans of intensely deep strategy, but for anyone interested in a few hours of light strategy fun, it’s quite the catch. Check it out, and share your thoughts in our discussion thread.